See FAQ for setup with the RigBlaster Pro, RigBlaster Plus, MFJ 1275, and MFJ 1279 sound card interfaces. Using CAT/CIV commands and a second serial port (DTR Option) to generate Morse Code. 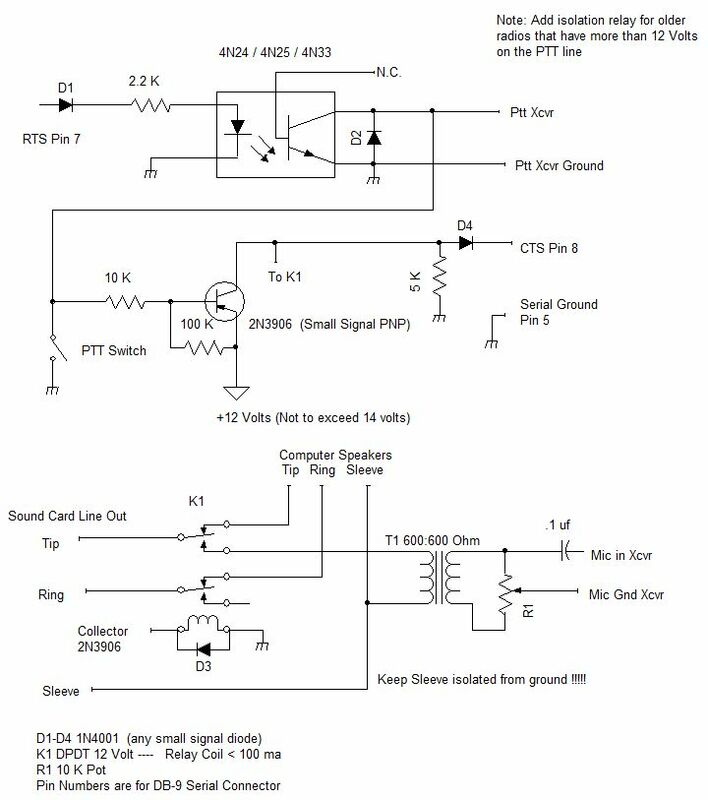 The keying circuit is not for older rigs that have more than 12 volts on the manual CW key jack. Using CAT/CIV commands and using audio to send the ID. Complete sound card interface for the CW identifier. Select "Raise RTS on CTS in serial port options. When the CW I'der starts sending the ID the transceiver will be keyed and the the ID will be sent. Bypass capacitors have been omitted for clarity. Use .01 uF to bypass the 12 VDC lines. The Output of T1 may paralleled with your microphone or connected to auxiliary connector on the back of your radio. You may omit K1 and just run the sound cards Line Out (Speakers) to an isolation transformer and parallel the output of the transformer to your Microphone on you transceiver, or connected to the an auxiliary connector on the back of your radio. 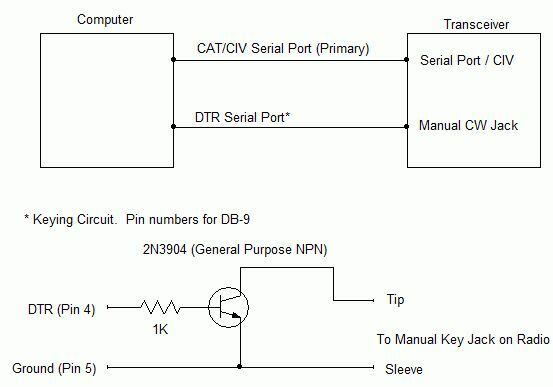 The PTT switch will key your radio, regardless whether the software is running or power is applied to this circuit.